For the beginner guitarist who wants to sample a ton of cool tones on the cheap, a budget multi-effects box can give you a great introduction to how the various effects available sound and how you can put them together to build your own sound. Here’s a rundown of some of the best out there. Please post in the comments if you use (and love, or hate) an ME box that isn’t listed here. The Vox Tonelab ST. Ton of sounds: some good. Cool “chickenhead” knobs. 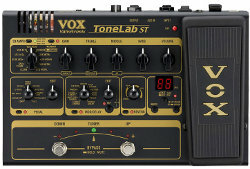 Vox are marketing the Tonelab St as an amp simulator primarily, but the unit also includes all the modulation sounds you could ask for, as well as an expression pedal that not only acts as a wah or volume pedal, but can also be utilized to change effects like tremelo speed, gain levels, flanger depth etc., which is pretty cool. The Tonelab provides thirty three classic amp sounds as well as different cabinet configurations. The ST can also be used as a usb audio interface so you can plug into your computer and record your guitar. The Tonelab is housed in a rugged, aluminum case and looks like it might be road worthy, but moving between presets can be a pain. Reviews of the Tonelab ST are generally positive. Some consider the preset tones sorely lacking. (I own a Tonelab ST and I agree with this sentiment. I don’t like the presets at all. –Dave) Though once you fiddle with the knobs enough, you can get close to the sounds you are after. Some reviewers commented the ST is probably better for recording straight to computer or playing through headphones than running through an amp. The Line 6 M5. Any pedal you want, one at a time. I love the simplicity of this one. 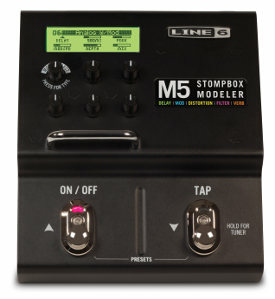 The M5 aims to please both the stompbox purists as well as the tech heads with their straight down the middle design. The M5 is like a “Swiss Army knife” stompbox that can sit on your board and act as a delay, or flanger, or phaser or just about anything you want it to be. It can only do one effect at a time, though, and is mainly used to fill in for those pedals you don’t own or don’t use often. The M5 boasts no less than nineteen delays, including ping pong, analog echo, and tape echo, which can have you playing tap style country licks as they did in the fifties or creating vast swathes of sound like they did in the eighties. There are twenty three modulation sounds, so your tremelo, phaser, flanger, and ring modulations are taken care of, and the seventeen distortions will ensure that you won’t get bored with the sounds on offer quickly. The “battle ready” casing means that this is a true “stomp” box also, and perfect for the gigging guitarist who going to be lugging their gear around from venue to venue. Reviews are mostly positive, but some users complained about poor distortion and overdrive sounds. Some mentioned that the pedal is better for recording than live. 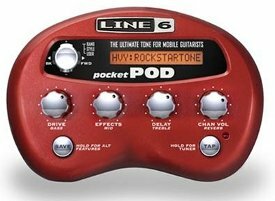 The Line 6 Pod: Cute. Plastic. When Line 6 debuted the first Pod it caused waves with its breakthrough design, cool sounds, and suitability for both home and live playing. The original Pod had sixteen amp sounds, but times have changed, and now the mini “Pocket Pod” manages to fit thirty two amp models onto a hand-sized unit that is about the same size as a Boss effects pedal. At the same time, the Pod has over three hundred preset sounds set by bands including Maroon 5 and Hoobastank. With a USB option, you can hook the small device up to your computer and edit the sounds yourself, as well as downloading new sounds online for free from the Line 6 range. There is also the option to plug your headphones straight into the Pod and practice with your electric anywhere and anytime. This is also made possible by the fact that the Pod can be simply powered with four AA batteries. All of this sounds very attractive, especially when you factor in the relatively modest price tag of about a hundred and twenty five dollars, but customer reviews of the Pocket Pod have been decidedly mixed. Complaints have been leveled at the apparently cheap and breakable casing that covers the Pod, as well as some issues with hiss after the unit has been played for a while. From the subsequent testimony of the same customers, it seems that the Line 6 customer care section leaves a lot to be desired as regards servicing for disappointed customers. A further complaint centers on the short battery life of just a few hours, but this is generally the case with multi-effects units anyway, and shouldn’t be seen as a problem that only concerns the Pod. The Pocket Pod ain’t a take-it-to-the-bar-and-gig-with-it stomp box. It’s a sit-it-on-your-desk-by-the-computer box made of plastic. You can get decent sounds out of it, but like most modelers, you’ve got to be ready to do some knob twiddling to get the sounds you want. The Boss company have a well founded reputation for producing great quality sounds at a price affordable to most, and their stompboxes have been used by many a well known recording artist. Check out any guitar players rig and you’re bound to find a colorful Boss pedal lurking in there somewhere, whether it’s the orange of the Boss distortion, the grey of the delay, or the purple flanger. Boss multi-effects units are not quite as iconic as their stompbox cousins, however, despite constantly receiving top marks in any review that they are put through. It’s perhaps a mark of the guitarist’s quest for “authenticity” that leads them more toward the single pedals than the multi-effects units. 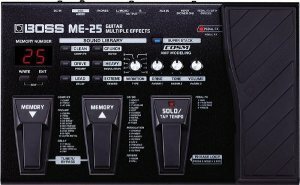 The Boss ME-25 Guitar Multi-Effects Pedal sets out, as all Boss multi-effects do, to put the classic sounds of the company’s stompboxes into a single unit, and by and large it would seem that they have done well. The unit itself features four pedals: memory up, memory down, and solo/tap, as well as an expression pedal. The “Sound Library” then is organized by the sound you are looking for in your tone- clean, crunch etc. Once selected this home tone can then be modified by compression, modulation, delay, and reverb. There are also classic amp simulations as well as further effects for the expression pedal. The unit also features a loop feature, which allows you to record yourself playing a short backing track and then looping it in order to play along. It’s also operable only by battery power. User reviews for the ME-25 have been largely positive, with some pointing the impressive battery life, as well as the range of classic sounds available. Coming in at around two hundred dollars with the power supply included, the ME-25 might be out of the price range of some, especially younger players, but judging from the reviews it’s received, it certainly represents value for money. The Zoom G3X amp simulator and modeler. The Zoom G3, along with its big brother the G3X (which features an expression pedal), is the latest in Zoom’s line of affordable yet quality multi-effects. It features one hundred and sixteen effects, six of which can be used simultaneously. This may not sound like much at first, but when you consider that you will not be using the fuzz setting at the same time as distortion, or the compressor and limiter simultaneously either, it begins to make more sense. 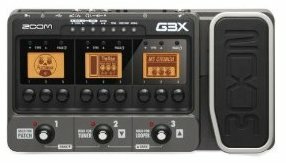 Very few guitarists will want to use more than six effects simultaneously anyway (with the possible exception of a guitar player in a U2 tribute band), the G3 is exactly what most of us need. Along with the usual effects, there is also the looper function, which allows you to record forty seconds of audio, as well as a forty different rhythm tracks, so that you can have your own personal drummer to jam with. An interesting feature that Zoom is using when marketing both pedals is that they feature the quickest patch change time in the world. According to the Zoom site, changing from one sound to another takes exactly one millisecond, thus ensuring that you never miss a beat when playing live. Adjusting volume levels between patches so that such changes are completely seamless may take a little more time. Coming in at around two hundred dollars for the larger G3X, these pedals in the Zoom range may not be representative of the more “budget” sections (like G1N and G1XN, retail prices sixty and eighty dollars respectively) of the company’s catalogue, but for the sound quality and features available, the G3 and G3X are certainly worth taking the time to try out. Early industry and customer reviews have been positive, citing the unit’s ease of use and range of sounds in particular. Guitar World’s overview of the G3X. Most crusty vets would rather use any of these boxes as a door stop. But new guitarists looking to experiment with a ton of different sounds previously unavailable except via expensive dedicated analog stomp boxes might just love a multi-effects processor. As always, let your ear be the final judge. I bought my Vox Tonelab at Amazon. Dave, Hi. Just stumbled upon your website & "Top 5 Multi-Effects Processors Under $200" Simply wanted to know when the review/article was (approximately) written, because I know the companies are forever endlessly upgrading and tweaking their products, usually, (but not always) for the better. Just wanted to get an idea of when the comparisons were done - - and if you're aware of any updated version of the 5 since you originally wrote your review. Well written by the way. Really, exactly what I was looking for; I own Zero SpEfx processors for my $250 Strat, and since I'm only an occasional player, (for my own amusement - so no band, no playing out etc) I wanted to add a bit of variety to my playing, but at a "budget" price which I pegged around $200.00 tops now in March 2016. Many Thanks for the article and any additional info you can provide. Yours, Jonathan Kaplan, White Plains, NY . Hi Jonathan, thanks for the comment. Here's the super late repy! this article as written around 2013 or 2014. What did you end up getting? The Zoom G3 is really great because you can stack effects in endless ways. For example you can even stack one amp model into another. You can also do this with their sub $100 G1on pedal. Thanks for the comment, Carl! I bought that Zoom G1on a few months ago... For a budget multi-fx pedal it's a lot of FUN, especially for beginners and bedroom players. I'm using mine in a reggae band (so that's 99% of all the presets and sounds utterly useless and thrown out in favour of custom presets lol) and I would hope these more expensive counterparts can withstand the rigours of rehearsals and gigs, because mine isn't holding up very well at all!